We've have been busy this past month. Today, I caught a mouse in our back yard but Grandma made me drop it. I really wanted to keep it. A couple of weeks ago, I found some really stinky stuff to roll in. Mom had to take me home early that day, give me a bath ( YUCK!) and wash my collar/bowtie. Then I found more a couple days later! Mom wasn't too happy about me rolling in stinky stuff twice and I wasn't too happy about getting a second bath. Humans just don't appreciate a good roll in stinky stuff. 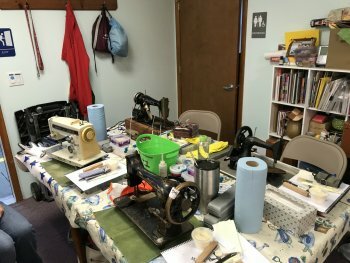 I know all of you have read about the Sew Purty Workshops Vintage Sewing Machine Restoration workshop we hosted last weekend. It was a hit! 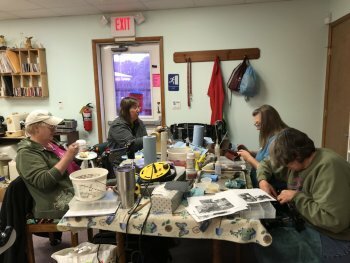 We had some local friends take the class and we had a lady drive up from Virginia, one came from New Jersey and we even had one fly in from Washington State. We made some new friends, including one from Hornell, NY. It was a lot of fun, I got lots and lots of attention. I had to come in with Mom both Saturday and Sunday to greet everyone. It was a couple of long days and this pup is still tuckered out. 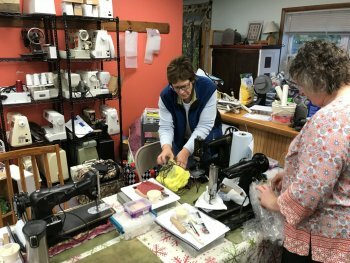 Everyone learned lots of new things about vintage sewing machines and how to restore them. Mom restored an Singer RAF Model 15 from 1937 that had been waiting a shelf for a couple of years for some TLC and wiring work. 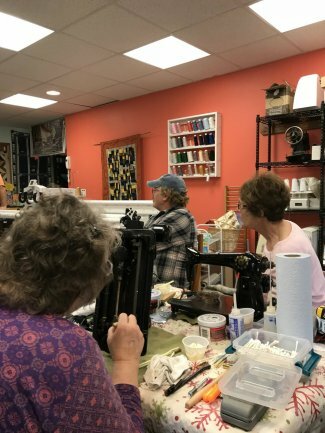 We would like to thank everyone who attended and also thank Sew Purty Workshops for coming to teach the workshop. 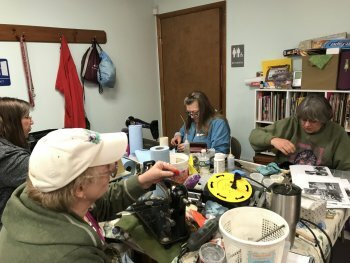 Here's some photos of the 2 Day Workshop. We are hoping to host another Vintage Restoration Workshop with Sew Purty Workshops sometime next year. 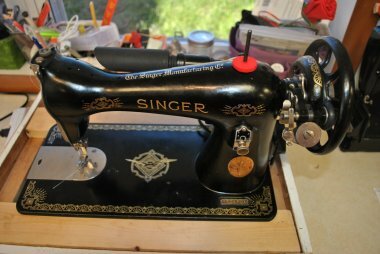 This is Mom's Singer after she restored it. She forgot to take before photos of it. It was pretty dirty and in need of some re wiring. 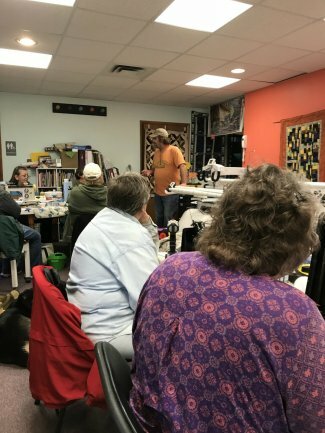 Ray Elkins, the instructor, of Sew Purty Workshops isn't able to teach re wiring outside of Kentucky but he can help with trouble shooting. This is me on Monday. 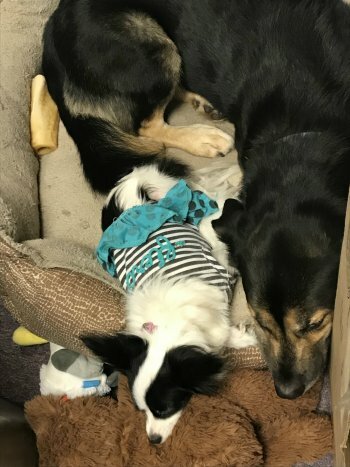 Moda the Bandit Dog decided taking a nap was a good idea, too. She almost always had to nap with me. She also spends a lot of time doing exactly what I'm doing. She's a copy cat and somewhat of a pest. 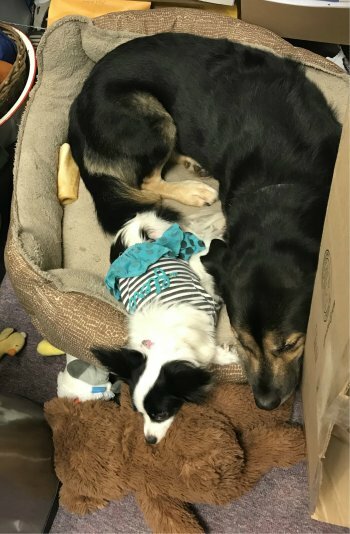 Moda is Grandma's dog. She's a Papillon, which means "butterfly" in French. Don't leave any open bags on the floor because Moda likes to steal stuff out of bags, purses, coat pockets, etc. We have received our first shipment of Northcott Fabrics Broken Glass Collection. 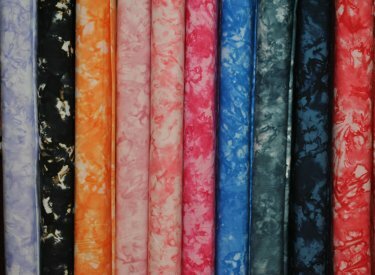 It is an interesting batik blender collection with a lot of bright colors. We will be getting 2 more shipments of the collection over the next few months. The last but not least event going on at the Shop is coming up this Saturday, November 3rd. It's time for our Free Pattern and Demo Day! Light refreshments will be served and a Door Prize will be given as well. It's a great way to kick off your weekend! 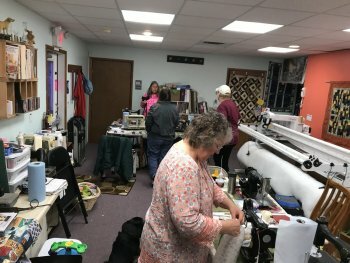 Stop in to get a free pattern and see how the first block is made. As always, the pattern is a surprise. 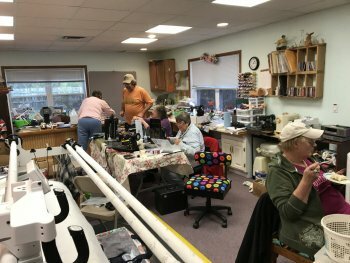 To round up our long newsletter. We have a Show 'N Tell this month. A T-Shirt quilt made by Judy P.
This is Judy's first T-Shirt quilt. 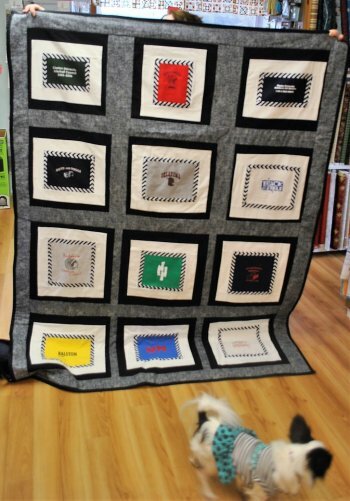 As you can see, Moda the Bandit Dog had to get into the photo and inspect the quilt. 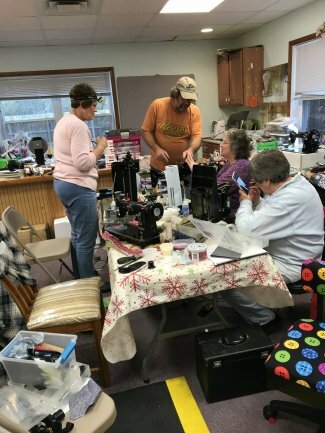 This finishes up our November Newsletter. We hope everyone has a Spooky Halloween and Happy Thanksgiving!